FLY TO TRAVAASA HANA / MOKULELE AIRLINES FEATURES THRICE-DAILY FLIGHTS FROM KAHULUI (OGG) to HANA AIRPORT (HNM). THE JOURNEY TO TRAVAASA HANA / THE ROAD HUGS MAUI'S NORTHEASTERN COAST, SKIRTING FORESTED RAVINES AND COUNTLESS WATERFALLS. HO'OKIPA (HOSPITALITY) / IT'S A HAWAIIAN WAY OF LIFE. THE HISTORY OF HANA / UNPARALLELED BEAUTY AND A BASEBALL TEAM PUT IT ON THE MAP. RENT A CAR AND EXPLORE HANA / TRAVERSE BEAUTIFUL EASTERN MAUI IN YOUR OWN JEEP OR CAR. In Hana, Hawaiian culture is as important as breathing. Timeless local customs such as throw-net fishing and lei making are still a fundamental part of this community's fabric. At Travaasa, we're proud to be a member of such an extraordinary and tightly knit community. Here at the eastern edge of Maui, you are completely removed from the ordinary, and yet completely involved in the moment. The magic of Heavenly Hana simply has to be experienced to be believed. It's a Hawaiian way of life. The minute you arrive at Travaasa Hana, you sense that you have been invited into someone's home. You receive a warm, casual, heartfelt greeting at our outdoor reception area. You'll be given a cool towel scented with lemon water to refresh you after your journey, and a traditional glass of Pog (guava, passionfruit and orange juice). This is genuine Hawaiian hospitality. A graciousness of times gone by. It's not scripted; it's natural. There is no training for this kind of hospitality. It is something every one of our team members, our ‘OHana (family), grew up with. Our hospitality comes from living the Hawaiian lifestyle. And it shows. In fact, some of our repeat guests are charmed when they get invited to a family event at one our team member's homes. Our hospitality extends to everyday life. It doesn't stop after an eight-hour shift. This is the kind of genuine hospitality that can only come out of a place where there's no stoplight, no stop sign, no road rage and everyone waves to each other on the road with a truly natural smile. "Why be in a rush?" we ask. You are not rushed off to your room. You are not rushed off anywhere. There's no pressure here (so much so that you'll notice we don't have any clocks, TVs or radios in your room). We want you to stop and pass the time away in the Hawaiian tradition. It's something every single one of our team members grew up with. For Travaasa Hana, it's a tradition of hospitality, spanning more than 60 years. Your reception at the Travaasa Hana begins with a spectacular 49-mile drive along the coast, and ends with a Ti leaf lei in our lobby. Between point A and point B is one of the world's most amazing journeys. It's called the Hana Highway (or commonly known as the Road to Hana), and it is often referred to as one of the most scenic drives in America (visit R2H to learn more). The road's serpentine course follows Maui's northeastern coast, skirting forested ravines and countless waterfalls. The drive takes anywhere from two to four hours, but we recommend you make it a half day. That's right. We invite you to not hurry to the Travaasa Hana. Take your time, savor the scenery, and embrace the journey. You'll be glad you did. The Hana Highway is a popular day trip for many visitors of Maui, but one of the biggest perks of being a Travaasa Hana guest is that you can truly savor the drive with no pressure to return to the other side of the isle by nightfall. In fact, many guests choose to drive here in the afternoon, when many drivers are heading in the opposite direction. Our vision at Travaasa has always been to uncover the magic of travel — the story of the journey. The road to the Travaasa Hana will give you stories to last a lifetime, even before your stay at our hotel. 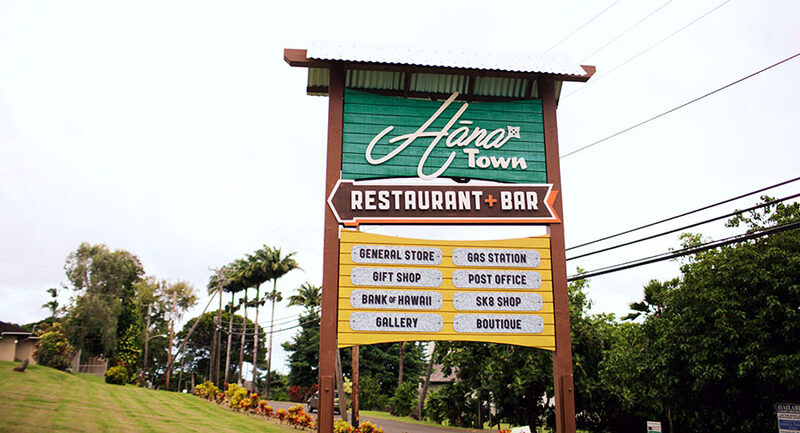 Just across the street from the resort you'll find the charming shopping center Hana Town, which is home to our casual dining restaurant along with other shops and services. Ask a reservations team member for details. Call ahead from your room to order take-out from Hana Ranch Restaurant. What started out as a "retirement project" evolved into the world-class destination that only a privileged few ever get to experience. But what really helped put Hana on the map (besides its unparalleled beauty) was a baseball team. The story begins just after the Second World War with Paul Fagan, an entrepreneur from San Francisco. He had investments in the area and wanted to retire here. However, jobs were scarce for the residents and the town's survival was seriously in doubt. Paul believed Hana held tremendous potential as a tourist destination. Together with his wife Helene, they designed a hotel for first-class travelers. This was an age when there was no such thing as a cut-rate tour, so upscale travel was the order of the day. In October 1946, the Ka''uiki Inn opened. Hawaiian press accounts hailed it as "the glamorous new resort on the Hana Coast." Paul knew he had to get the word out to the mainland. Being a majority owner of the Pacific Coast League''s San Francisco Seals, he knew the team needed a location for Spring Training in 1947. Since his team had just won the PCL Championship and set an attendance record, he "awarded" them with a trip to Hana. The team also brought along a cadre of sportswriters who wrote glowing reports about the inn and the area. One writer even coined the nickname still used today "Heavenly Hana." Their stories helped put Hana and the inn on the map. The inn eventually evolved into the Hotel Hana-Maui. Small and quietly isolated, Hana quickly became a world-class destination for travelers and celebrities looking to get away from it all. And while the hotel has expanded and changed hands several times over the decades, one principle will always guide us at Travaasa Hana. To keep "Heavenly Hana" Maui''s truly last Hawaiian place. Enjoy this selection of audio vignettes we've compiled to give you a glimpse into the richness of Hana. Explore available off-property excursions and on-site activities available at Travaasa Hana, Maui. Travaasa Hana, Maui is proud to offer car rentals locally in partnership with Enterprise Rent-A-Car®. 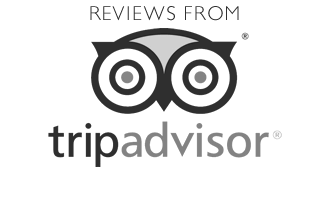 Ask a reservations team member for full pricing and availability. Prices are seasonal and subject to change. 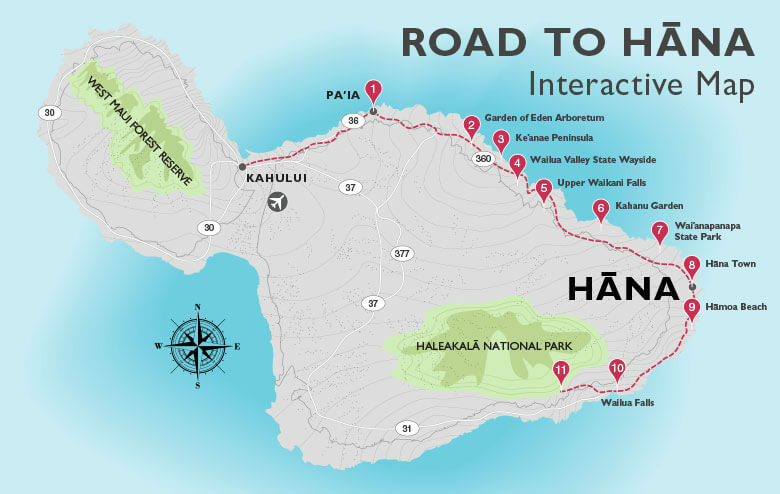 Getting to Hana has never been easier. 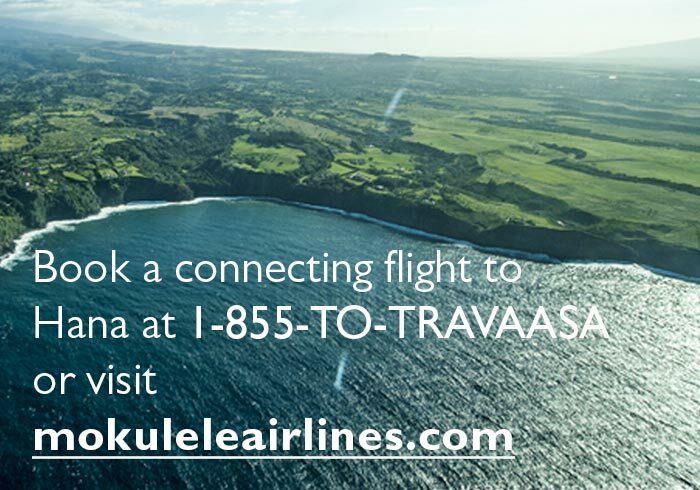 In partnership with Mokulele Airlines, Travaasa offers the ability connect from Kahului (OGG), with two-way shuttle service from the resort to Hana Airport (HNM). We'll even include roundtrip airfare from Kahului to Hana Airport when you book three or more consecutive nights on a Total Travaasa Package. Ask a reservations team member for details.